KIEV, Ukraine -- Western powers are clinging to a fraying peace deal in Ukraine and forcing Kiev to follow suit, even though Russian President Vladimir Putin shows no sign of wavering and NATO is warning that Moscow may be preparing for a new offensive. The United States and European Union are still backing the three-month old ceasefire, despite a growing feeling that it is in its death throes, telling Putin that sanctions will remain if he does not honour his promises. This offers little consolation to Ukrainian President Petro Poroshenko who, while under pressure at home over a steady loss of troops fighting pro-Moscow rebels in the east, has to keep in diplomatic step with the West whose political and financial help he needs. His feelings showed in Berlin on Wednesday when a German journalist suggested eastern Ukraine was relatively calm. "I'd like to contradict that because Ukraine is paying a very high price today for this pseudo-ceasefire," he retorted, noting 83 Ukrainian servicemen had died since a second peace deal was signed in the Belarus capital of Minsk in February. "Ukraine is losing heroes every day but we continue to absolutely support the Minsk agreements," he told ZDF TV. Three Ukrainian soldiers were killed in the past 24 hours, a military spokesman said on Sunday. Few people in Kiev believe Putin will lessen his support for the separatists in a conflict that has killed more than 6,200 people in just over a year. He may simply be waiting till the EU decides in June on extending sanctions on Russia's financial, defence and energy sectors before showing his hand. While it has been sickly from birth, no-one wants to administer the last rites on the ceasefire. "Based on the Minsk agreement from February, we have to note that we are not yet where we want to be. We still don't have a complete ceasefire," German Chancellor Angela Merkel said in Berlin alongside Poroshenko. Lithuania's anti-Moscow president, Dalia Grybauskaite, was blunter. "The ceasefire no longer exists," she told Reuters. Kiev-based political analyst Volodymyr Fesenko believes the the Europeans in particular are labouring under an illusion. "They try to cling to this mirage and move things in that direction," he said. "Ukraine's Western partners will not undertake anything new. They will try, to the very last, to revive the corpse called the Minsk agreements." Some commentators detected a softer tone when U.S. Secretary of State John Kerry met Putin last week. However, the United States has accused Russia of failing to withdraw heavy equipment such as air defence systems, tanks and artillery from eastern Ukraine in violation of the Minsk plan. NATO's top commander, General Philip Breedlove, told the U.S. Congress last month that Russia's military might be using the truce to prepare for a new offensive in support of the separatists. Any new Russian-backed thrust is likely to focus on the coastal city of Mariupol. If it fell, the rebels might be able to open a land corridor to Crimea, which Russia annexed last year. 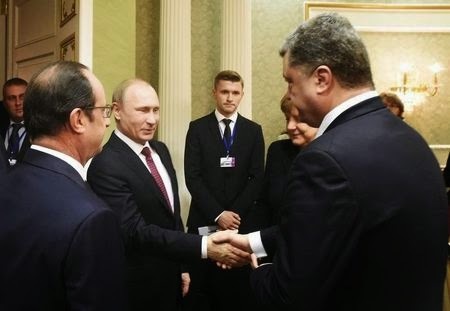 Many see a fundamental difference of perception between European leaders and Poroshenko. While the EU can live with a patchy ceasefire that avoids large-scale loss of life, Kiev must face the steady flow of casualties and uncertainty over what Putin might do next. Even the gains achieved under the Minsk deal are flawed. Both sides have pulled back large-calibre guns and tanks from most of the front line, but they are still being used against government troops at the main pressure points, Kiev says. Despite some prisoner exchanges, Moscow is still holding Nadia Savchenko, a celebrated air force pilot seized in eastern Ukraine and spirited into Russia. More importantly for Ukrainians, the Minsk agreements include no plan for Kiev to recover territory lost to the rebels. As long as violence continues in the east, even at a reduced level, Kiev has little chance of holding local elections there as planned at the end of this year. "The simple reason why the political agenda of Minsk-2 has gone nowhere very fast is that the agenda ratifies Russian strategic gains and therefore runs counter to the national goals set by the Ukrainian government," Christopher Granville, managing director of London-based consultancy Trusted Sources, wrote in a note. Despite frequent meetings with Western leaders, Putin's end-game is not clear. He appears to have little interest for now in annexing separatist-controlled areas, which would be costly as their local economies are depressed. It is not in Putin's nature to "blink". He cannot afford to back down on Ukraine as he would lose popularity at home and looking weak is not an option. He has ordered Russia's first naval war games in the eastern Mediterranean with China and held a string of meetings with military top brass recently. But, with the deaths of Russian troops in Ukraine a possible threat to his standing, he might judge that waging a full-blown war in Ukraine is too economically and politically risky. Russian companies not under sanctions are hoping to return to the international bond market later this year as investors are tempted by high-yielding debt. But any re-intensification of the Ukraine crisis could sink such ambitions. If Putin's aim is to support a low-level conflict which complicates Ukraine's moves towards NATO and mainstream Europe, then all he has to do for now is do nothing. "Their (Russia's) strategic goals have not changed a tad: to hold all of Ukraine in check by controlling the east. For this they do need to see Minsk implemented," said a Western diplomat in Moscow.